But the fact is, I'm not a betting man. I work for my dad's investment company, and that means it's my job to help people out with money. Sometimes it's approval of a loan, sometimes it's helping them invest. In the case of Poly, it was neither, because when she needed help, she didn't come to me--she went to her ex-boyfriend. (If I were a betting man, I would have put my money on me instead of him, but I'm a bit biased.) Dad taught me to assess risk and make educated decisions on behalf of other people's money. On paper, maybe Poly wasn't a good risk, but I would have helped her out anyway. But the problem isn't with her loan. It's with the fact that she could have come to me for help but she didn't. Does that mean she still has feelings for the other guy? Doesn't she remember how he acted when he found out about the kittens? Or that he wanted her to sell the fabric store that she inherited? Or the fact that he matches his dinner to the day of the week? My sister Charlie thinks the whole thing is funny. She said she's never seen me stress over a woman before. I'll tell you one thing: Polyester Monroe is unlike any woman I've ever met. I were a betting man, I'd say she could be the one. So I guess it's a good thing that I'm not, right? Great review! Yes I believe romance is worth the risk. My husband and I come Oct 10th will have our 30th Annv. and he was in England and I was here in the USA, we both live here in California now with our 2 daughters. Diane Vallere is one of my favorite authors. I love her Mad for Mod series the best. Of course romance is worth the risk! But sometimes getting there can be pretty funny. Thanks for the giveaway for this great series. Romance is worth the risk. Sure it is worth the risk! Yup, I think it's totally worth the risk! Thanks for the chance to win!!! Always bet on love Vaughn! Thanks for the chance to win! You won't know unless you take the risk. Romance is well worth the risk. Thanks for the chance. What a fantastic sounding book! Already on my TBR list. Yes. It's worth the risk. Thanks for the chance. I feel romance is worth the risk! Romance can be scary---but definitely worth the risk. Romance is certainly worth the risk. I have been happily married for 43 years some of it romantic some not. Risky but worth it for sure. Life is a risk. Go for it! I love this series so far. Can't wait to see what Poly gets into next! As for romance, I met my husband 46 years ago this October. I nearly fell down the stairs when I first saw him. I was truly blinded by romance. I admit to not having a lot of experience in this area, but I believe romance is worth the risk. Thank you for the chance to win. Romance is always worth the risk. Thanks for the chance! This is a great author and series. 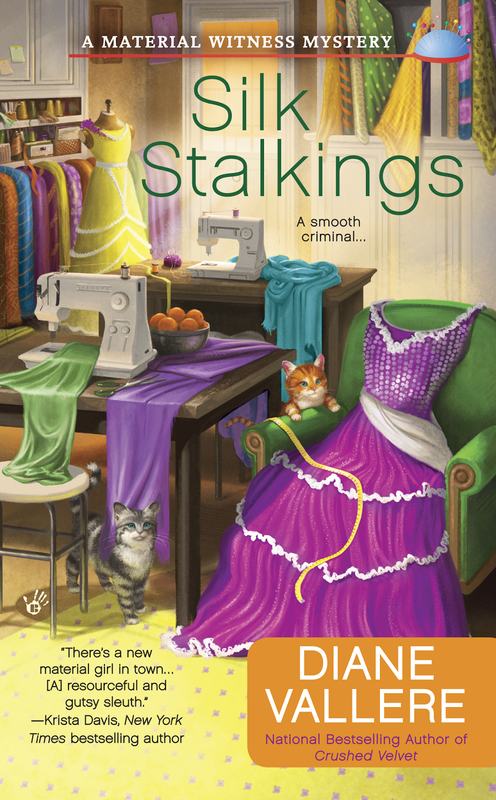 Can't wait to read "Silk Stalkings". Can't wait to see what Poly is up too. I generally don't take a risk when it comes to romance. But perhaps that's why I'm single? Congratulations, Brittany! You're the winner of a copy of SILK STALKINGS (Kindle copy or paperback, your choice)! It's worth it. Thanks for a chance. Of course, it is worth the risk! You never know what you might miss if you never risk Romance. Romance is always worth the risk. Romance is ALWAYS worth the risk! My personal experience led to 27 years of marriage. Absolutely worth the risk. Excited about the giveaway. I'm looking for a new series. This one sounds fun. kchinetti at gmail dot com. Romance is always risky...sounds like a good book. Yes. Romance is worth the risk. if I had not risked calling my husband in high school we might have lost the chance to be the friends and lovers that we are. Yes, you have to take the chance. I need to get this book. It is definitely worth the risk. After cruelly being separated from my first and only true love for 32 years, (the only good thing that came out of my first marriage were my 3 girls! )we have finally found each other again and are now married and still finish each other's sentences. Romance, oh yes! It is definitely worth the risk!!! Happiness was worth the wait. Romance is the key. Yes romance is worth the risk. If you don't take a chance and turn away from it, you can miss something wonderful. Yes, I think romance is worth the risk and "if I were a betting man", I'd say Vince will take that chance! Contest is now closed. Congrats, Brittany Abbot!